January 18th in Plugin Lists by Wordpress Jedi . Flagged Content Pro: a commercial plugin that lets your visitors report and flag posts and comments. It automatically injects buttons into posts and comments. 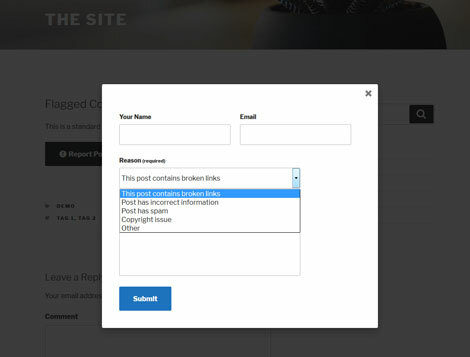 Your visitors can choose the reason they are reporting each item. Zeno Report Comments: a free plugin that allows your visitors to report an appropriate comment. After your set threshold is reached, the comment is put into moderation, so you can deal with it. Have you found other plugins that let your visitors flag posts and comments? Please share them here.